This is the second in a series of articles discussing the strategy and tactics of Godslayer, designed to provide new players with tips for getting the most fun out of the game and how to gain victory. In this second article we will discuss bloody business of engaging, charges and melee. This article should offer both experienced players and beginners some useful tips. 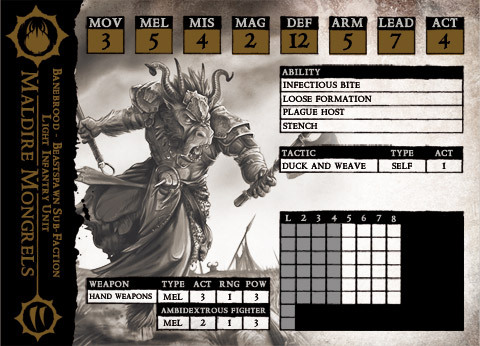 As with all these articles we will assume that readers are at least familiar with the quick-start rules and have played a couple of games but occasionally we might refer to parts of the regular core rules since the core rules are the standard rules for playing Godslayer. In the first article we discussed general strategy and order of activations. Now let’s talk about the second most fundamental part of the game – melee, since melee combat is really the meat and potatoes of the game. There are several factors to consider in order to get the most out of your charges and your melee attacks and the first one is charging. Although you can move your models into melee range through normal movement actions and then make attacks against enemy models, by far the best way of getting into melee is through a Charge action. The first rule of charging is: it is better to charge than to be charged! Charging gives you free movement of 2X your MOV +2 inches. It also gives you a bonus of +1 MEL and +1 POW on your chargers attacks for the whole turn! So charging really makes sense in almost every case! Keep in mind that charges must take place in a straight line and require line of sight from charging model to target model. And remember, unit models declare their charge targets individually, and it is only necessary for one of them to successfully reach the enemy for the whole unit to count as having a successful charge. So if one or two of your unit models has a wall in the way and cannot charge – no problem, charge with the rest of the unit and simply move them along with their buddies. Also keep in mind that models can charge over difficult terrain. This will cut your movement in half, but sometimes you will have enough movement anyway, especially with light infantry or models with MOV4. Of course, to charge, you need to be within range. That means accurate guessing distance. If you want to be good at guessing charge ranges and ranges in general, you need to practice. Get two models, put them on the table then guess the range. Then measure it. Do that for a couple of hours and you will be damn good at estimating. It is best to be certain you can make it if you make a charge because a failed charge is a nightmare – your activation ends and your chargers basically committed strategic suicide. Bear in mind that in addition to your charge movement, you also have your MEL range. For most models MEL range is one inch, but for some it can be two inches. So you do not need to get into base contact, only into MEL-range. If you are able to engage multiple enemy units/models, then it usually makes sense to do so. This will prevent those engaged models/units from charging you. Apart from that, where you place your models should be based on: A) melee range of your models’ weapons and B) how good they are in melee. If your models have range-2 weapons such as spears, and the enemy has range-1 weapons such as axes, then definitely place your models more than one inch away from any enemy models, but closer than two inches. In this way your troops can attack but the opponent’s models cannot make counter-attacks. How good your models are in melee should determine how you group your guys. For example, Reaver Tribesmen have a poor melee skill of 5, which is the level of militia-type troops) and average POW of 4, so you should try to get at least two Reaver Tribesmen into melee range of a single enemy model. They need to gang-up on the enemy. Remember – dead enemies cannot attack you later in the round! So try to kill enemy models fast. It is much better to fully kill 5 models than to half-kill 10 models because that is 5 models who will not be making counter attacks later on. For example, if your unit of 10 Reaver Tribesmen charges a unit of 8 legionnaires, then try to place your 10 guys so they are attacking 5 Legionnaires. This means only 5 legionnaires can counter-attack, lessening your potential losses. Conversely, if you are charging weak enemy models with your elites (high-point models) or even elites that have been buffed, then you want to space your models a little more widely to cause maximum casualties. It is entirely possible that they will kill a low-point enemy model with a single attack if you have good rolls and they are buffed, so they should probably have two enemy models in range. I prefer to place two of my elites in range of 3 enemy models, not more than that, because there is still the matter of counter-attacks from those models. Putting one of your elites in melee range with four or five enemy models means certain death for your model when the enemy counter attacks. So the second rule of charging is: Place your chargers as advantageously as possible. Remember that if a unit you are charging has not activated yet, then it will almost certainly be able to make counter-attacks every time you make an attack. Naturally it is better to charge units which have already spent their action tokens, but even target units which have full action tokens are worth charging if your unit or model is approximately equal to or better than the opposing unit. It is even better to charge with a potentially weaker unit than to allow them to be charged instead… remember the +1/+1 bonus, and the enemy is not allowed to chose a fighting style, so effectively loses a +1 bonus. Although charging is usually an advantageous action to perform, there are times when it’s better not to rush headlong into the bloody crucible of combat. A) If the opposing unit is much better (for example where each model has double the points of yours, then the charge is likely to end badly for your guys. 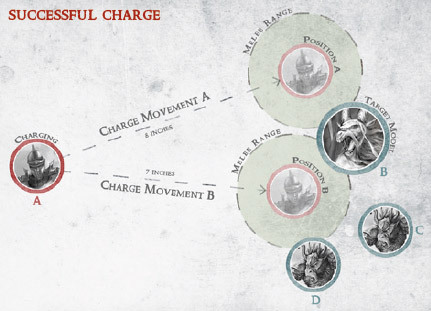 Some charges can leave the charging unit in the midst of the enemy’s battle-line, where it can be charged and/or engaged by several other units while your other units might not be in range to support them. Nevertheless, sometimes there are no better options and it is still preferable to charge than to be charged! But on the whole, try to avoid suicidal charges unless it contributes to your game strategy. Even desperate charges can have some beneficial effect if you make the most out of it by buffing your chargers and placing them advantageously (as described in the previous section). There are actually no units that have zero chances against any other unit, no matter how many points they are worth…even a unit of Gnolls can take out some ogres. A) Never charge your warlord into a unit without support from some of your troops, unless he is a melee warlord* and even then, you should be careful to place him so that he is engaging only one or two models. You definitely do not want to place your warlord in melee range of 5 enemy models which will each be counter-attacking every time your warlord makes a single attack. Better to place him in melee range with one model of the enemy unit if they are elites, or two enemy models if they are mediocre/poor troops. The above principle holds true for Characters and Creatures too – especially less powerful creatures. B) Missile troops should shoot not fight. This means troops whose MIS value is higher than their MEL value. Unless they are backed into a corner and are certain to be charged, you will have better chances to hit by shooting. Missile troops generally have low ARM and are therefore very squishy in melee. Models like Bladeslingers, Beasthunter and Bloodgut Ravager can act as missile troops but are actually more effective in melee, so this does not apply to them. Similarly, spell-casters should be casting spells not fighting. Even spell-casters who have good armor and the Battle-Caster ability (allowing them to cast spells while engaged) should spend their action tokens on casting spells whenever possible. •Try not to charge ethereal models into melee against models that have enchanted attacks or MAG attacks, since you will squander your primary advantage – your ethereal ability. •Try not to charge expensive elites with high armor against models that have MAG attacks or direct-damage attacks because you may not break-even in points lost vs. kill-points gained since you lose your advantage of great armor. •If possible avoid charging your low-POW models against enemies with high ARM. If you have no other option, then try to buff your chargers beforehand. •Charging models who have low-LEAD against horror-causing models or those which require a successful LEAD test in order to attack them is a foregone catastrophe. So clearly it makes sense to charge under most circumstances, but even in cases where you cannot make a charge, it sometimes still makes sense to move up to the enemy and engage them. Whereas a charge represents a sudden, fast, direct movement towards the enemy whereby the charging models gain momentum and determination, engaging by movement represents something less dramatic with less impetus. A) When the enemy is outside of your charge range but your troops are still inside their charge range. For example: a unit of Amazons is standing 10 inches away from your Skannfyrd Kinswords. Your charge range is only 8 inches +1 inch MEL-range, while the Amazons have a 14-inch charge range. So you move your Kinswords three times and engage them with your MEL-range of one inch. Even if the Amazons are in charge range, it is often better just to engage them due to their sub-faction ability which allows them D3 inches free movement when charged. B) When an enemy model represents a juicy target but is out of range. For example: the opponent’s warlord or a character. How attractive a charge it is depends largely on the relative points values. 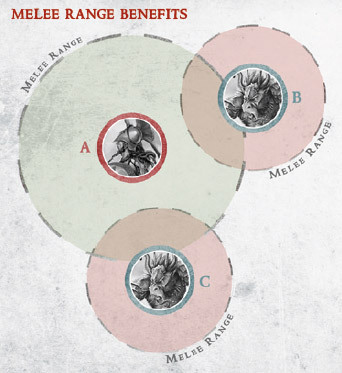 So an Oracle or Farfarer within engagement range of your three Skulleaters would be a delicious charge, while it would make little sense engaging a Duskborn Chieftain with your Bard. C) When a target is worth engaging but cannot be charged due to obstacles or forest preventing charge movement. For example, there is a Necromagus out in the open, and a Valkyrie cannot charge him because there is a patch of forest in the way blocking line of sight. The Necromagus is worth plenty of points and taking him out would severely deflate the effectiveness of the opponent’s Legio Mortum units. The Nordgaard player has his warlord assign the Valkyrie an action token so that she has 6 ACT at the start of her activation. She moves twice around the edge of the forest (8 inches) until she is engaging the Necromagus with her 2-inch MEL range. Now the Valkyrie can still make two attacks since she still has 4 ACT left. Although she does not get the charge bonus, she can still chose a fighting style. Example 2: You have a unit of Ironhide Brutes who already have the ordered tactic carnage active and have received an action token from the warlord. You were planning to charge a unit of Fjell Warriors but the Fjell Warriors already fled, and the next reasonable target for your Brutes is a unit of Fimbul Toughborns who are approximately 10 inches away which is beyond their charge range of 8 inches. Therefore you move your Brutes 3 times (9 inches), and with their 1 inch melee range, most of the Toughborns are within your melee range. Now you are still able to make one attack with a fighting style. It’s certainly not as good as if you had been able to charge and make two attacks with charge bonus, but a lot better than nothing. D) When the enemy models are within charge range but there is no line of sight due to buildings. 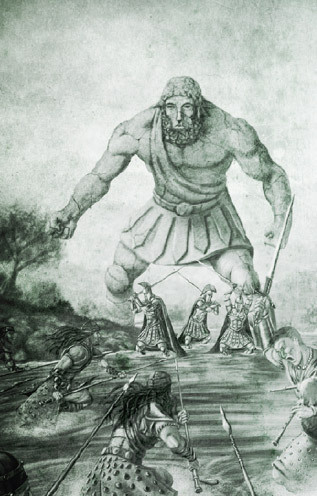 For example, in an urban street-fight among the ruins of an ancient city there are 5 Reaver Runts around the corner from your two Hill Ogres. They are only 6 inches away but you have no line of sight through the wall. So even when your model/unit does not have enough action tokens left over to make an attack after engaging, it can still be worthwhile engaging the enemy. If you are in a position where your model/unit is about to be charged, you need to weigh-up the two options – if you stay put, you will have action tokens left to make counter-attacks, but if you engage the enemy, you can deny them their charge bonus. For example your unit of Fjell Warriors has a charge range of 6 inches and they are under imminent threat of being charged by a unit of 5 Gut-Hackers. That will surely spell the end for your Dwarves. The Gut-Hackers are 9 inches away, which means they can charge you with their 10-inch charge range but you cannot possible reach them with your stumpy little legs. Fortunately the next turn is yours, so you activate your Fjell Warriors and move them four times (8 inches) and engage the Gut-Hackers. Then you activate Shield Wall on your Fjell Warriors. Next you activate your Warlord (Runegate Keeper) and he buffs your Fjell Warriors with the tactic Fortify, giving them +1 ARM. Together with their Shield-Wall tactic which gives them +1 DEF and +1 ARM, they now DEF13 and ARM10. Although they cannot make any attacks because their action tokens are all spent, the Fjell Warriors have prevented the Gut-Hackers from gaining a charge bonus and also prepared themselves against the attacks of the Gut-Hackers. In most cases Dwarves can only react to the enemy because of their ponderous speed, but in this way the Nordgaard player has stolen the initiative from the speedy Banebrood. For maximum sneakiness, when you move the Fjell Warriors to engage the Gut-Hackers, place them so that only one Toughborn is engaging the Gut-Hackers. This forces the Gut-Hackers to waste one action token on movement in order to get more unit models into melee range. This wasted ACT cannot now be spent on melee attacks and means the Gut-Hackers can now only make 2 weak attacks (for 4 ACT) or one heavy attack (for 3 ACT) instead of one heavy and one weak attack. So in the above example, the Fjell Warriors are certainly going to suffer some damage, but far less than if they had been charged by the Gut-Hackers! This tactic can work well for defensive units such as Hoplites and Legionnaires. One of the beauties of Godslayer is how interactively the play flows back and forth due to models being able to make passive activations. The most common passive activation is that of counter-attacking. Assuming it has action tokens left in its pool, when a model is attacked it may make a counter-attack. Unless a unit/model has a strike-rank above 1 all combat is assumed to be simultaneous, so counter-attacking models can kill opposing models even in the turn in which they themselves die. Of course if you chose not to counter attack with a model/unit, and your models die, then those dead models clearly cannot make attacks later when the unit is activated normally. So the action tokens of the dead are wasted; they died for nothing. For example, a unit of Grayhorns has charged a unit of Skulleaters. The Skulleaters have not yet activated in this round so they have their full quota of 5 Action tokens. 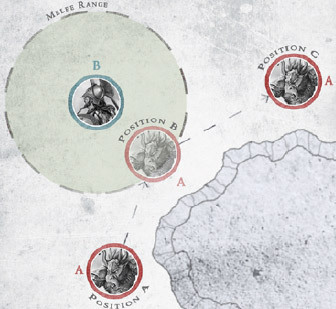 They could either chose to make a passive activation and make counter attacks for each attack of the Grayhorns, or they can take their chances and make a normal activation later or do both. The player of the Skulleaters decides to wait until his standard activation, unfortunately 4 of his 6 Skulleaters are butchered by some lucky attacks by the Grayhorns. That means 2 attacks from 4 models are now wasted, equaling eight lost attacks. There are disadvantages to counter-attacking. Firstly you get no fighting-style bonus when counter-attacking, and you cannot activate tactics during a passive activation, so cannot buff your attacks if the buff is not already activated. This means counter-attacks are usually weaker than making normal attacks during a standard activation. More importantly, models of a unit may only counter-attack the model/unit which is attacking them, and you may have very few models in melee range to fight. For example, when your unit is charged by the opponent’s warlord and he has placed his model so that only one model of your unit is in melee range. A) Do not counter-attack if you anticipate you will not lose too many models of your unit from the enemy’s attacks. In this way you will be able to attack the enemy during your standard activation, benefitting from the possibility of using tactics, fighting-style bonus, spells, ordered tactics and other buffs. B) Similarly to the above, if you have a creature in melee and you are sure that the pesky 1-2 model/s attacking it will not kill it this turn, then there is no desperate need to counter-attack. Instead you could just sit back and plan the vengeance you will meet-out when you make your standard activation. This is also true of melee-characters* engaged with 1-2 mediocre enemy attackers. 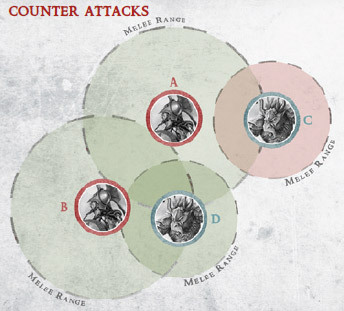 However, if your melee character or creature is engaged with three or more models, it often makes sense to perform at least one counter attack after the enemy’s first attacks in order to thin the enemy ranks and thereby reduce the amount of damage you will be taking with from later attacks. In such cases you need to weigh up the advantage and disadvantage of not counter-attacking. The advantage is that you will be able to make much more effective attacks if you wait and attack during your standard activation. The disadvantage is that you will probably lose more life-points if you wait. It all depends on the relative numbers and melee capabilities of each model. For example if my Valkyrie is being attacked by two Legionnaires, I would definitely not counter attack with my Valkyrie because she has very good defensive capabilities with her high ARM and Ethereal ability. Additionally, because of the high ARM of the Legionnaires, I will need to buff my Valkyrie’s attacks in order to do any serious damage. So in this case I wait. Conversely, if my Wyldfolk Stormbow Beasthunter is being attacked by a Feral Hammerfist, I would not wait to attack later since the Hammerfist is very offensive but quite squishy. I know that my Beasthunter will be able to deal the Hammerfist considerable damage and perhaps even kill him with counterattacks because of the Beasthunter’s general good melee skills (MEL6 & POW4) and the bonus he will get from his Taxidermist ability (+1 MEL, MIS or POW). In this case I really don’t need to wait and use tactics or spells or fighting style to buff my Beasthunter – his natural abilities make him good enough already. C) Warlords are very precious and if you think your warlord will lose more than a few life-points to the attacker/s, then it is better to counter attack, especially if you are faced with several mediocre models. By counter-attacking, your warlord could take out a couple of opposing models and still have a couple of action tokens left over for his standard activation. D) In most cases do not counter-attack when you have let’s say only less than half of your models or less in melee range to fight. In that case it probably makes more sense to wait and to properly position your models so that more than half can get in their attacks. Of course this puts one in a real quandary when a Warlord or Creature is butchering your unit models one by one, remaining in melee range with only one model at a time. But this is one of the advantages individual models have over units. In rare cases it could also make sense to risk counter-attacking in order to kill the last members of a depleted enemy unit. E) You cannot counter-attack if your models are not in range of the attackers due to their longer weapons (for example range-2 spears). In this case you must wait for your standard activation and then move into melee range, then make your attacks. F) Counter-attacking usually makes little sense if you have the ability/tactic Defiant in Death active. This tactic enables your models which are destroyed to be removed only at the end of the round. This means you can still use those models to fight during your own standard activation. So if you are attacked it makes more sense to wait until your standard activation, because then you can benefit from tactics, fighting-style bonus and buffing the unit with spells and orders. But let’s leave counter-attacking and return now to attacking, to examine attack types. You will notice that many models and units have several attack options listed on their profile cards or item cards. This enables you some tactical flexibility for example models with two-handed weapons often have a high-POW attack costing 3 ACT and a low-POW attack costing 2 ACT. Some models can even make 1-ACT attacks. Then there are some armed with weapons in both hands which can make 2 attacks for the cost of 3-ACT (using the Ambidextrous Fighter ability). To some the degree the attack you chose depends on the type of enemy, so against heavily armored models it makes sense to use the high-POW attack. Elite units have 5 action tokens per round and if you buff them with an assigned action token from your warlord, then they can usually make two high-POW attacks per turn costing 3-ACT each or three 2-ACT attacks. Models with the Ambidextrous Fighter ability should always use this type of attack when possible because both attacks count as a single action, which means opposing models can only make a single counter-attack following your double attack. Rare exception: Since both attacks from the ambidextrous attacks must target the same model it can occasionally make sense to instead use the 2-ACT attack twice. 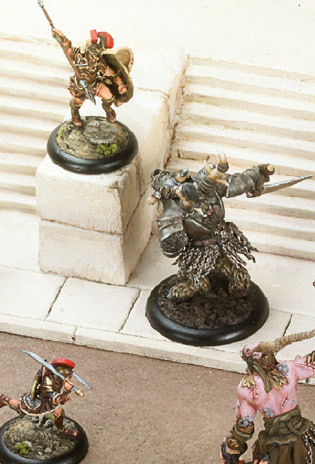 For example if you are fighting low-armored, low life-points models like Gnolls or Bladeslingers, especially if they already activated that round and thus cannot counter attack. In this case you may kill two models instead of one. Remember that individual models (creatures, Warlords and characters) benefit from the Slay-Movement rule. This means that if they kill the target of their charge with their charge attack, then they gain D3 inches movement and can make the same attack again for free. A free attack is always something really beneficial (not to mention the free movement), so to improve the chances of getting slay-movement there are a couple of things you can do. Firstly, if there is a choice of models to charge, then charge the one that will be easiest to kill, in most cases that means the model with the least remaining life-points. Secondly, be sure to use your best attack option. So if you have an ambidextrous option, then use that since both attacks will count as the charge attack, or if you have a high-POW attack that costs more ACT to use, then use that one. If attacking models with Ethereal, then use MAG attacks or enchanted attacks if you can. As mentioned previously, with individual models it is usually best to engage less models, and this is especially true when charging because you will get D3 inches free movement after you cut down your first victim. If you place your models correctly, this will enable you to then engage the next model. Remember that your free slay-movement attack is the same as the initial charge attack, so this is another reason to use your best attack on the charge. And of course, like all attacks in the round you charge, it also benefits from the charge bonus. When you make melee attacks during your standard activation you have the option of using either offensive fighting style (gaining +1 to hit) or Powerful fighting style (gaining +1 damage on your damage rolls). This is a matter of statistics. In general it is best to use the one which provides the greatest statistical improvement, but rolling to hit is more important. Rolling to hit is a Yes/No result – either you hit or you don’t, whereas with the damage roll you get an incremental result depending on your 2D6 roll + POW vs. ARM of the target. So generally it would make more sense to fight with Offensive fighting Style since it is better to hit and do low damage than to miss. This is indeed true up to a point. When the opponent has high armor and the attacking model has a low-POW attack, then it doesn’t matter if you hit or not because you will have such a low chance to do any damage. Although the damage roll is incremental we can also express the chances of doing damage (one or more points) or doing zero damage. For example, some Legionnaires are attacking buffed Einherjer. The Legionnaires have a POW of 2 with their gladius attack vs. an ARM of 10. This means your attackers need to roll a 9+ on the damage roll to do any damage. In this case the Legionnaires have a 27.76% chance of scoring any damage on the damage roll. Compare that with their roll to hit – MEL 6 against DEF12 means a 6+ to hit (72.18% chance to hit). So in this case it clearly makes sense to choose the Powerful fighting style since this will increase the chance to do damage from 27.76% to 41.64 (a gain of 13.88%). If they instead chose Offensive style to gain the +1 to hit, they would have only increased the chance to hit from 72.18% to 83.29 (11.11% gain). Unlike a 1D6 based game where each of the 6 numbers on a die has an equal chance of being rolled, in the 2D6-based games like Godslayer, each number has a different chance of being rolled because of the possible combinations. For example: to roll a 12 there is only one possible combination (6+6), but to roll a 7, there are six possible combinations (6+1, 5+2, 4+3, 3+4, 2+5, 1+6). We will look at this in more depth in article 3 of Scrolls of Victory. For now it is enough to know that you want both the to-hit roll and the damage roll to be a 5+ roll or better, but most important is the to-hit roll. So for example if you have a 7+ to hit and 6+ to cause any damage, then you should chose the Offensive fighting style so that you gain the +1 on the to-hit roll, making it 6+ to hit and 6+ to damage. Or if you have a 6+ to hit and 7+ to damage, you should still chose the +1 to hit, giving you a 5+ to hit and 7+ to damage. Once you are at 5+ to hit, then consider taking Powerful fighting style to increase your chances of causing damage. Remember, if you do not hit, then the damage bonus is useless. Godslayer is structured so that the average POW of models is around 4, and the average ARM is 7. So in an average case, you are already at 3+ to do any damage. The average MEL of models is 6 and average DEF is 13, so in most cases you need a 7+ to hit. So you can see in most cases it makes sense to take the Offensive fighting style to improve the to-hit roll. When is Offensive fighting style not as important? Once you are hitting on a 5+ (83.29%), it can be more useful to go for the +1 on the damage roll by taking Powerful fighting style. Or if you need are faced with a difficult 9+ to cause any damage and your roll to hit is already 6+ or better, then it also makes sense to fight with Powerful fighting style. Many models have some kind of tactic they can activate to increase their performance in melee. Hill Ogres can make their circular Slash, attack multiple models, Skulleaters can make Slay-Movement with their Carnage tactic, Fjell Warriors gain +1 to hit with their Skilled Strike ability etc. In most cases it makes sense to use these tactics, and so you should always try to activate them. Remember that before performing a charge action it is possible to use tactics, so you should do so before your charge. Some tactics cost zero ACT to use, while others cost 1 or more ACT. If you know you are going to need a tactic that costs 1+ ACT for one of your units, then try to assign an action token to that unit from the warlord or any other valid way before you activate the unit. This prevents you spending ACT which could be used to make attacks. For characters it is not so critical that they gain ACT from the warlord since they often have more ACT than units, and their effects are usually less than the massed effect of a unit, (and so it makes more sense to spend the warlord’s ACT on units). The above also holds true for spells. Generally it is a better investment to cast a spell on a unit rather than a character, and units buffed by spells before melee starts will surely perform better in battle; the same for ordered tactics and special talents. Models can have one self-tactic one ordered-tactic active at the same time and can be affected by any number of spells and special talents simultaneously. It is possible to save a lot of time (which would normally be spent stuck in melee accumulating losses to your warband) if you can break units and cause them to flee. This requires killing half or more of the models in a unit in one turn. Not so easy against large units. Remember this is half the models in a single turn, not the whole round. This could be one of your turns or one of your opponent’s turns (for example when you counter-attack an enemy unit). Killing the leader of a unit reduces the leadership of that unit by one point but keep in mind, that leaders normally have more LP than normal troopers. This increases the chances that the unit will fail the bravery test when it comes. To increase the chances of provoking the test, concentrate your attacks to eliminate entire models as fast as possible rather than just damaging all models in the unit. That’s all for this second Scrolls of Victory. I hope the above will help you gain many victories. The next article will concentrate on exposing some of the core mechanics of the game and show how you can best use these to your advantage. If there is a specific subject you would like to see discussed in the future then please leave a note in the forum.